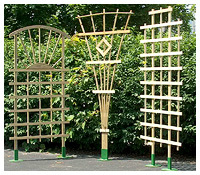 Add instant curb appeal to your home or business with an elegant decorative wooden trellis. Our most popular seller Country Craft's T-SR Sunrise Trellis creates an inviting focal point to any area around your home. From Clematis to Roses or any climbing plant or vine the T-SR Sunrise Trellis provides the support needed while adding a touch of distinction to your landscape. This strong durable trellis is manufactured from pressured treated yellow pine and will add unique decor to your landscape. 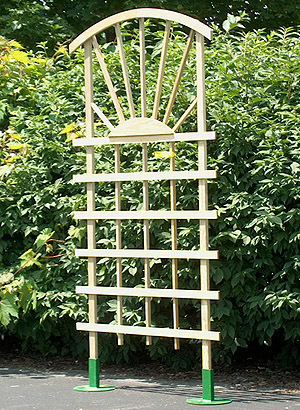 Country Craft T-SR Sunrise trellis is 76" high x 3' wide. Lath: 7/16" x 1 1/2"